We offer quality repair and competitive prices for all of your exhaust system and muffler repair needs. Make sure to stop by our 713 Silverado Trail location for an inspection, as a damaged exhaust can hurt both your car and the environment. 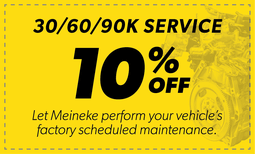 When you need brake repair, brake pad replacement, or even a total brake job, our local Napa, CA Meineke is there to help you with everything you need to drive (and stop) safely. The manager was professional, knowledgeable, enthusiastic about the business and I had a great experience. He treated every customer like his own family. Thank him for me! I just needed a Lyft inspection and I was treated like royalty. Dave and his staff are super!